The Bogside Publishing B-320 M is a 4-5/16 x 6-15/16 pocket size book. 8x4 square grid printed on white ledger paper that has 50% cotton content and is specially formulated for maximum archival service, ease of erasure and protected by a water resistant surface sizing. 128 pages with 16 page curve table. 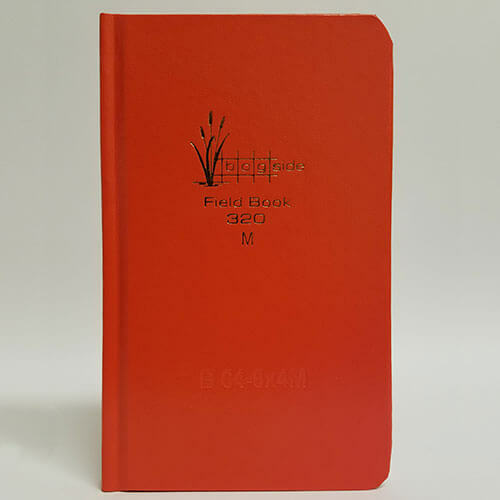 This high-quality field book has sewn in pages with a water-resistant hard cover and is printed and bound in the USA with a very high quality control. If you're looking for yesterday's quality, then you've found it with Bogside Field Books. The Bogside B-320M is the replacement equivalent for the Elan Pocket-Size Field Book E64-8x4M.